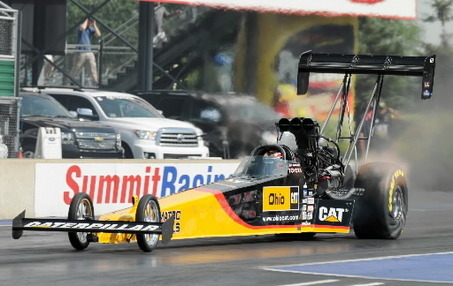 Caterpillar pulled the plug on David Powers Motorsports because the National Hot Rod Association team was in over its head and might have collapsed in mid-season. Racing writer Jane Miller of the Peoria Journal Star interviewed Rod Fuller, one of the team’s top drivers, who finds himself out of a job with the racing season about to begin. Fuller said he has been contacted by other teams but wants to remain with Caterpillar. Let’s hope he bought in October when it was cheap. Gonna be awhile before it gets back in the 80s again. Looks like this shutdown wasn’t so much about the economy as the missteps of Fuller’s racing team, which is selling off its drag-racing assets. David Powers Motorsports is selling its Top Fuel and show car program assets. The racing assets include two complete Brad Hadman race cars, 12 sets of cylinder heads, seven short blocks, a 2008 Caterpillar-powered Kenthworth tractor, and Competition Trailerstransporter. Wow, that would be fun stuff to have, assuming your garage is big enough.